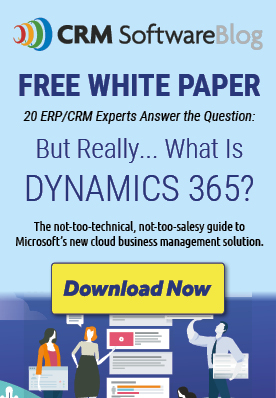 The implementation process of a new CRM solution such as Microsoft Dynamics 365 does not end on the go-live date: afterwards, a continuous effort is required to ensure that your users make full use of the system and its functionalities. After all, an implementation project is only truly successful if it helps your organization achieve its business objectives, simplify its processes and increase its resource productivity. But how do you ensure that users actually use your solution once it has been implemented? Here are 5 tips to drive user adoption in your organization and ensure that the solution keeps evolving with the needs of your users. Schedule follow-up training and review sessions. It’s important to schedule time for users to bring up any concerns, questions or issues they may have. You can also use the insights obtained during these sessions or in your user surveys to organize additional training sessions to address specific issues that have been brought up. Consolidate user feedback and data to assess your level of success. Compare the benchmarks and KPIs identified at the start of the process to your current numbers and see what areas need to be improved. Review surveys and listen to user feedback to assess their knowledge of the solution, then work with them on finding solutions. Encourage your end-users to get involved. Have them share tips and ideas as to how the solution can be used to improve their daily tasks and processes. Promote teamwork so that they can learn by helping each other. Hold departmental meetings where team members can brainstorm ideas to improve business practices. Have super-users available to answer day-to-day questions to avoid people reverting back to their old ways. Old habits die hard: users might find themselves finding workarounds or going back to their previous methods when they’re stuck. Having super-users readily available will help nip these tendencies in the bud. Show the positive changes to both end-users and management. Identify success stories and share them with the rest of the team. This will encourage continued adoption from the part of the users while also satisfying management by showcasing the return on your investment and improved KPIs. With these tips, you will be well-equipped to ensure that your new CRM solution helps your organization achieve its objectives and maximize your return on your investment. For more information, Microsoft offers documentation to help your organization measure the success of its implementation as well as sample user surveys.